Wednesday during his monthly radio show, Gov. 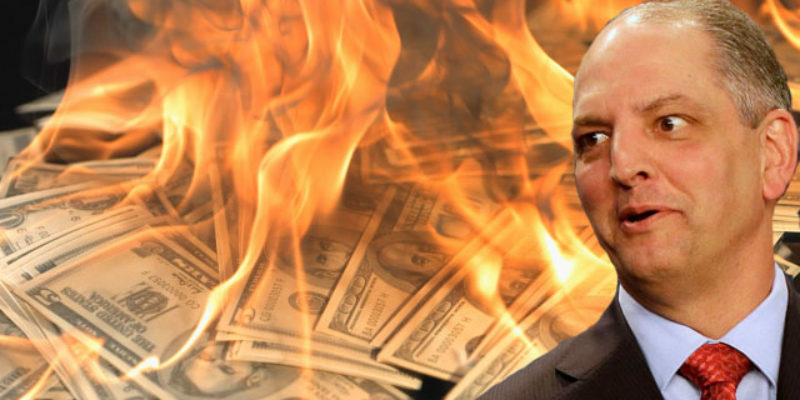 John Bel Edwards said he was skeptical that he’d be able to reach agreement with the Louisiana legislature on how to resolve the state’s budget impasse. “At this point, I don’t see a lot of reason to be optimistic that we are going to have a plan that we can agree upon in time to have a special session in February, although I am going to continue to work toward that end,” Edwards said during his monthly call-in radio show Wednesday. The state is staring at $1 billion worth of sales tax revenue falling off the books in the next fiscal year, which begins in July. The House Republican leadership has said they can’t get good feedback about what legislators are willing to do to replace that money, unless the governor, a Democrat, provides a more detailed plan about what he wants to do to fix the shortfall. This followed a meeting on Monday which doesn’t appear to have gone that well, largely because it appears the governor is stonewalling the legislators as to potential budget cuts he could accept. Edwards’ strategy appears to be demanding that Louisiana resolve the budget problems, which have been termed a “fiscal cliff” by his staff and the media alike, solely by raising taxes in an amount sufficient to replace nearly a billion dollars in revenue from a two-year temporary sales tax increase passed in 2016. That extra penny of state sales taxes comes off the books this year, leading to a fork in Louisiana’s fiscal road; either the state government can cut its budget, which under Edwards has grown from around $25 billion to $29.6 billion, it can make the sales tax increase permanent or replace it with other tax increases, or maybe craft a solution that meets somewhere in the middle. One would expect the latter of those three options is the one which will ultimately result. Everyone knows this, which is why it seems strange that Edwards isn’t willing to put anything on the table in the way of spending reductions. To the contrary, word around the legislature has it that the governor had a conference call last week with higher education leaders giving them marching orders to publicly demand that legislators raise taxes – something F. King Alexander, LSU’s president, appears to have heeded with the op-ed in the Baton Rouge Advocate he penned earlier this week. “I am disappointed to see that, despite his claims, Governor Edwards has yet to provide any specific details on this plan to address our state’s billion-dollar shortfall. The taxpayers of this state deserve more than general talking points and vague concepts. They deserve simple, yet specific details like the actual bills, the fiscal notes and the financial impact. “It is shocking to see so many of our Democratic colleagues blindly following the governor without knowing any specifics of his plan like what will be in the bill or what the impact will be to families and businesses. Maybe they believe you have to pass the bill to know what’s in it. “The hardworking citizens and businesses of this state deserve more. They deserve to know exactly what the governor has planned and exactly what the financial impact will be. Harris and Henry, along with a number of other House members, were particularly peeved about a document Edwards circulated sketching out a number of relatively broad tax ideas as a means of replacing the extra penny of sales taxes and making a number of claims about how he’s already made draconian budget cuts and the state can’t take any more. That was the subject of a fiery segment Rep. Alan Seabaugh had on KEEL Radio Friday morning, after which Edwards called Seabaugh a “liar” in response to a planted question at his Baton Rouge Press Club appearance. To date, the governor seems satisfied to maintain this posture of refusing any discussion of budget cuts and blame the entire fiscal mess on the intransigence of the Legislature. His problem is that what looks to him like good politics this week will become not so good later – because if nothing is done and no special session is had before the regular session begins in March then no taxes can be raised; those can only happen during a fiscal regular session, in an odd-numbered year. He’d have to call another special session in June after this regular session is over. And until then, Edwards would be stuck trying to resolve the budget deficit through the spending cuts he currently refuses to discuss. Edwards knows this, and so do the legislators. They’re well aware that he has no real leverage on them in order to raise the taxes he wants, which is why they’re so irritated at his posturing. After all, they’ve all seen this movie before – it’s the only one on this governor’s projector, and the reviews haven’t been any good in any of its previous showings. It’s hard to see how this will go well for the governor. Previous Article COURRÈGES: Are Soviet Tractors the Real Culprit for New Orleans’ Parade Delays?